The Drôme is a multifaceted region. With great food, breathtaking scenery, fantastic things to do and activities for the whole family, there'll be something for everyone! There's really no doubt about it, your holidays will be action-packed at the camping Les Bois du Châtelas! Thrills and excitement guaranteed at the crocodile farm. Introduce your children to the 400 or so types of animal that have made this place famous: alligators, giant tortoises, tropical birds and more. And to see even more birdlife, stop off at the gorgeous Upie zoo while you're here. It's magical! For trips into the depths of nature, head for the emblematic Vercors regional nature reserve. Hikes, amazing views, outdoor sports and great food all on the menu. Lake of "Pas des Ondes"
Your stay at the camping Les Bois de Châtelas will be punctuated by new discoveries and other marvels. Not far from your holiday location, you'll just love the village of Dieulefit, featuring heritage, nature and art, which you really must come and see! Montelimar will reveal itself to you in a really lovely way. This is the home of nougat, where you'll also appreciate the lavender fields stretching away into the distance beneath the gentle sunshine of Provence, all cradled by the sound of the cicadas. Setting off from Montelimar towards Mont Ventoux, stop off at Grignan too, a fortified hilltop village in the heart of Drôme Provençale. And if you still want to see more, then there are all sorts of other towns and villages which form part of the beauty and renown of the region, which include Diois, Bourdeaux, Crest and Nyon! A gateway to Provence at the foot of the prealpine mountains and just a stone's throw from the Côtes du Rhône and Clairette de Die vineyards, between olive groves and lavender fields, the Bois du Châtelas campsite offers the perfect holiday destination. Its Mediterranean Provençal climate couldn't be better for those long summer evenings. During your stay, explore the pretty village of Bourdeaux. Only 1 km from the campsite, it lies on the banks of the Roubion, perfect for a refreshing swim. Perched on its rocky outcrop, once a centre of French Protestantism, the village has successfully conserved and even enhanced its natural heritage. Today Bourdeaux has a population of 621 and is the main town of the local district. In addition to its shops and amenities, that serve both locals and holidaymakers, it holds a regional market every Thursday. And being a town where agriculture remains predominant, the palette of local produce on offer never fails to delight. The crystal clear waters of the Drôme flow from the Alps down to Provence, the air filled with the scent of lavender and the song of the cicadas. Choose one of the three possible options, from 3 km to 45 km, and paddle downstream for 1 or 2 days with family or friends (from 6 years). Choose “Canoë-Drôme” with their two canoe bases on the banks of the Drôme. Enjoy walking? 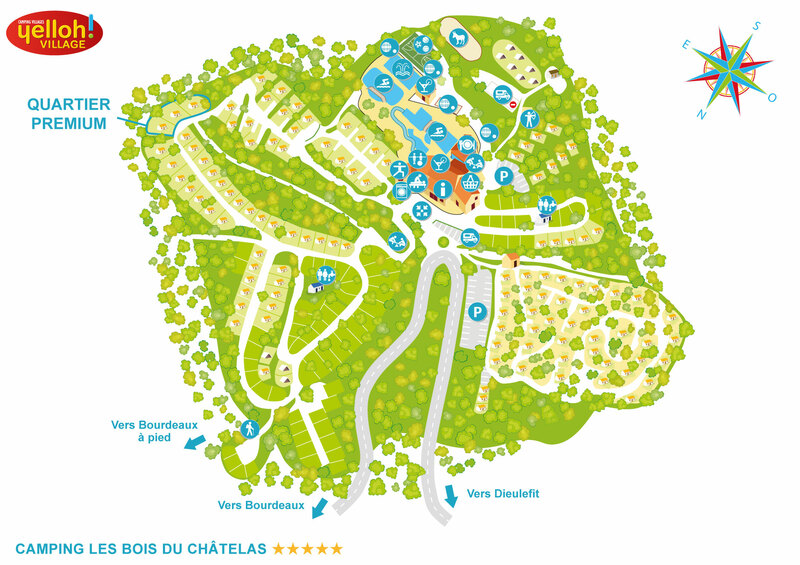 During your holiday at camping Les Bois du Châtelas you’ll be delighted to discover no less than 5,000 km of marked hiking trails! From long-distance footpaths to short circular routes, there is something for everyone. Whether you prefer a gentle walk for a couple of hours or a day-long hike; with family, with friends or with a guide, the choice is yours. The GR9 long-distance footpath crosses the campsite and you can enjoy it for the short walk to the village of Bourdeaux via the Châtelas ruins (1.5 km) or try the Saulnier circular walk (11 km). This is great mountain bike country, with high quality trails leaving directly from the campsite and from close by. The Drôme à vélo cycling guide offers over 2,000 km of roads specially recommended for cyclists, with their own specific marking. 18 circular tours are included on the Drôme à vélo Cyclocarte map published by the Departmental Council and the IGN. An alternative way to enjoy some of the sumptuous sites and scenery of the Drôme. In July and August, our trained staff are available to guide you through the glorious nature that surrounds Les Bois du Châtelas. Want to get the adrenalin pumping? Try an afternoon's rock climbing and discover the region from a different angle. The Drôme is a climber's paradise and close to the campsite you'll find over 700 routes with something for everyone, whatever their level. Beginners can try their hand in 2 different locations: Le Rocher des Abeilles, Soyans (south face) and La Graville, Saoû (north face). A natural boat-shaped area, the Saou Forest is home to some amazing wildlife. Walk quietly along its paths and you might come cross chamois, wild boar, deer, foxes, badgers or even marmots. Look to the skies to see how many different birds you can spot: royal eagles, buzzards and other birds of prey... Fall under the charm of this generous landscape with its forested areas, moorland and grassland, rocky slopes, cliffs and ledges, and the wetlands of the alluvial forest. Join in the mediaeval festivities that take place on 15 August each year and discover the legend of Alberte de Poitiers. Mediaeval meal, serenades, a candlelit parade, evening market, craft fair... plenty to see and do! Alberte, the daughter of the lord of Bourdeaux, had two suitors: Alfrédis de Mornans and Hérald de Bézaudun. Alberte and Alfrédis had long been meeting in secret and fallen in love, finally her father agrees to their marriage. Alfrédis' first opponent is none other then Hérald! Wearing Alberte's scarf he cries: "By this favour I wear, the name of my Lady is clear to all". And Alberte? She never recovered, dying on the same day as her husband.